I love recipes that taste better the next day and the day after. I bring my lunch to work, pilule so if I can make a big batch of something on Monday and enjoy it for the rest of the week, visit this I’m happy. This is one of those salads. The chickpeas and orzo absorbs the tangy, buy more about peppery vinaigrette until they’re tangy and peppery themselves. A little slice of prosciutto (or Serrano ham if you can afford it) and it’s my idea of a perfect lunch. Place the oil, vinegar, salt and peppers in a food processor or blender and blend until smooth. Set aside. Cook the orzo until al dente, then drain and run with cold water to stop the cooking. 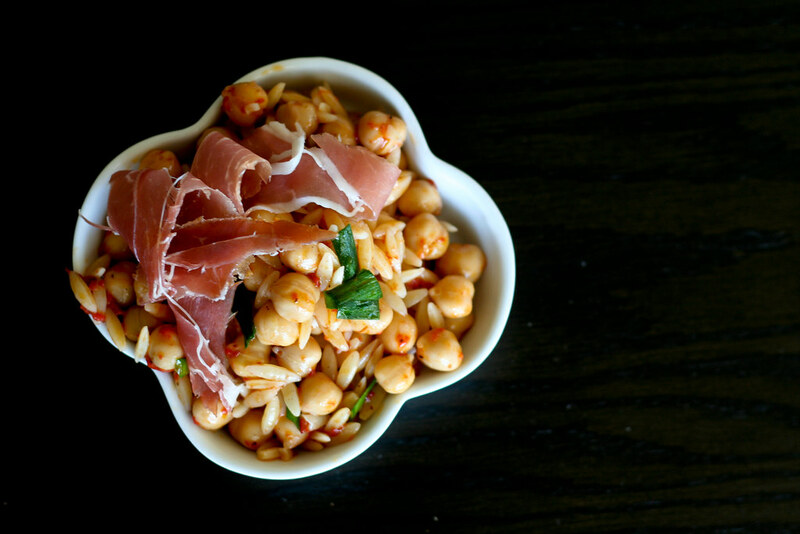 Place the orzo, chickpeas and chives in a bowl and toss with the vinaigrette. Let marinate for 2 – 3 hours (optional). Serve topped with a slice of prosciutto or 2. Makes 4 servings as an entree or 8 as a side. Stunning photos. You’ve made me crave some prosciutto now. Ooooh – that looks divine. I agree this is a perfect lunch. I like doing the same thing, I make a big meal on sunday with the idea that I can carry leftovers the next day. That looks wonderful! I need to start making more salads that will last me through the work week. I also have never cooked with chickpeas before and really want to try. This is great! 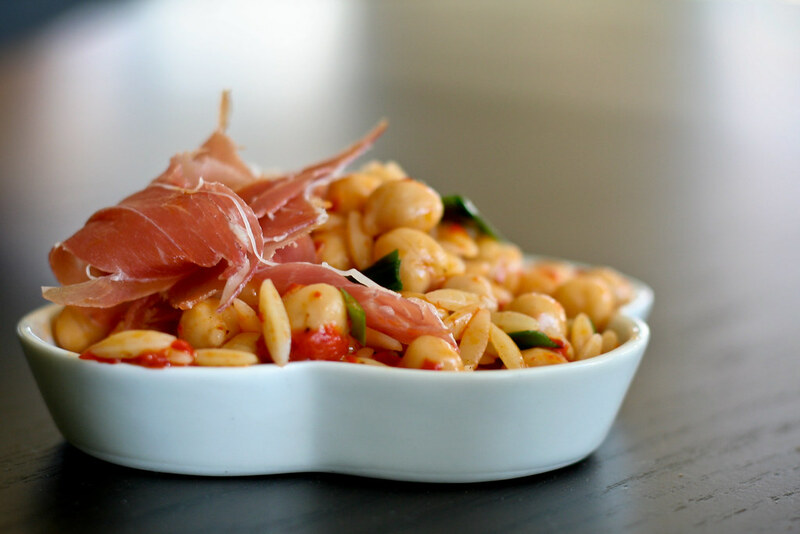 I have both chickpeas and orzo in the pantry and been waiting for an opportunity to use them! I’m eating this for lunch right now! My is not as pretty as yours but it’s very tasty! Thanks for posting this! I am totally addicted to piquillo peppers right now. Perfect recipe to quench it, gorgeous photo.